Cities and towns across China are losing some of their biggest employers in a process reminiscent of the factory shutdowns that decades ago hit Rust Belt America, from Detroit to Baltimore. Paper mills are being forced out of the southern city of Dongguan as it tries to prod manufacturers to move up the value chain. In the northern county of Luquan, made wealthy by cement, scores of polluting producers have shut down as the local government tries to retool the area for tourism; a full-scale replica of the Great Sphinx of Giza—made of cement—stands on the city’s edge. As communities begin to hollow out, it is straining a social compact that has been a feature of the Communist Party’s rule: that state-owned companies would take care of the industrial workforce, even in difficult times. It is a bargain meant to keep workers from going on strike, or worse, becoming a source of antigovernment unrest, like the dockyard workers who helped bring down Poland’s communist government. In Qingbaijiang, the industrial district where Panchenggang sits north of Chengdu, thousands of residents have gone elsewhere in search of employment. “For Rent” signs line the streets of once-bustling neighborhoods. Petty crime is edging up. Read the whole thing, and be sure to check out the spooky video with nice aerial photography of the steel mill and town. This is a phenomenon we’re only going to hear more about in coming years. It’s not unknown in China currently, but most of the examples I’ve seen of empty “rust belt” towns are in the northeast, and are rare in the rest of the country. As the paragraph above highlights, one of the main ways to deal with local economic decline is for people simply to move. 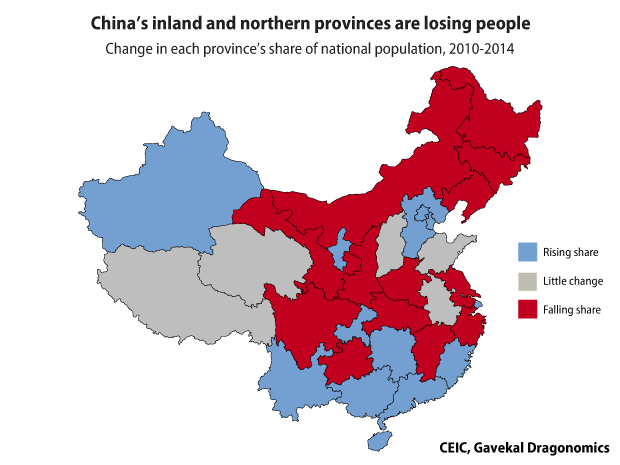 In fact, the northern and inland provinces have been gradually losing population in recent years, at least in relative terms (the national population is still growing, so not that many places have an absolute decline in population). Again, this fits the regional pattern of industrial structure and economic distress that I’ve written about several times on this blog: the declining industries are disproportionately located in the inland provinces, particularly north and west. So people have been leaving those places and concentrating in the zones of prosperity with more and better jobs, primarily the Beijing-Tianjin-Hebei area and the southern coastal provinces. The need to allow people to migrate to help them adjust to the changing economic structure only reinforces the urgency of overhauling China’s household-registration system, which creates lots of disincentives for migration by limiting migrants’ access to social services. There was a lot of discussion about this soon after Premier Li Keqiang took office, but little has been heard of late. I suspect this is because the government is not prepared for the big increase in fiscal spending that would be required to equalize treatment. ← Previous Post Is Singapore the future of language?